PREMIUM NEOPRENE MATERIAL & EXQUISITE WORKMANSHIP – Made of premium neoprene and nylon material, Becko’s waist trimmer is stretchable, durable anti-slip and comfortable to wear during exercise. Fine workmanship of edge enhances durability, making it look more fashionable. 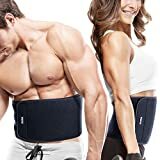 EXTRA WIDE DESIGN FOR ENTIRE ABDOMINAL AREA & DUAL-LAYERED COMPRESSION BELT TO STRENGTHEN TUMMY ABS – Wide enough to cover the stomach area to remove excess water weight, exercise the abdomen, and maximize the optimum temperature in the belly to burn off the calories for a slimmer physique. Dual-layered compression belt with velcro fastener to adjust strength for a comfortable fit and protect abdominal. VERSATILE USAGE FOR SLIMMING & PROTECTION – Can be used to shed off excess water weight, trim and tone tummy, enhance aerobic condition, improve posture, protect lower back muscle and abdomen from strain and fatigue when do Yoga, go Cycling, go for a workout, a run or a walk. DESIGN OF HOLDS FOR VENTILATION – Interior holds help you shed off sweat, keep ventilate and dry to keep away from bacteria when you do exercise. Hand wash with cold water and air-dry overnight after each use. Waist trimmer belt width 21 cm length 113 cm. WARM TIPS OF USE – Please do not wear if you have an open wound, or if you’re susceptible to dermatitis or allergic to neoprene. Should only be worn during exercise for no more than 2-3 hours at a time. Please air it before your first use. Made of premium neoprene, Becko’s waist trimmer is durable, functional and wide enough to strengthen tummy Abs and protect your back. Interior small holds enhance ventilation and breathability to keep you away from stink and bacteria. Becko’s exercise band is best for men and women to use as a body trimmer for weight loss or a workout belt. Extra compression belt with velcro helps you enhance the strength and promote exercise effect. When use Becko’s waist wrap for the first time, please wipe down the belt with a damp cloth and use a clean cloth dry off or air-dry it overnight. After exercise, you can hand wash it with cold water and soap, then dry it off for the next use.